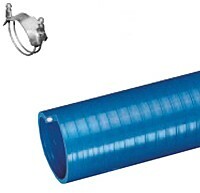 • Features and Benefits: Heavy duty PVC construction - provides superior vacuum rating. Color is solid blue. Smooth cover on sizes 1" through 2". Convoluted cover on 3" and 4" for greater flexibility.